I say, Veruca Salt rocks. In case you need a reminder, she’s the “spoiled brat” from Charlie and the Chocolate Factory. You can read my blog post about what I like about her here: So, What’s So Bad about Veruca Salt? Strength of will, and by that I mean knowing exactly what you want and demanding and expecting it of the Universe and not giving up until you get it, is the key to getting whatever you truly want out of life. And Veruca has that down. Forget living to please other people. Demand that the Universe give you what you want. Remember that “no” is just a thought, just a word. There is no “no” when you are fully committed to something that you really want with all your heart. Of course, we can have a strong, vibrant, powerful will in a more positive way than Veruca Salt. We don’t have to rely on other people to be the sole channel for the things that we want. We’re not children anymore. We can focus our wills on what we want and take consistent, inspired action until we achieve our heartfelt goals. But like Veruca does: we don’t have to take no for an answer. Let yourself discover what you really want, be persistent, and don’t give up until you get it. And that’s how you will build that will muscle so it will be something you can rely on to help you get what you want out of life. Think about a goal that you want to achieve. And then, let this be your mantra for the day: This is what I want and I WILL get it! I want it NOW! Say that a few times to yourself and see if you can feel your will getting stronger, your resolve to live a life that truly fulfills and inspires you getting more powerful. I can feel it, can you? I created my Your Inspiring Life self-help program to help us all overcome the inner barriers to achieving our heartfelt goals and help us focus our wills with clear intention and passion on whatever we want to experience and accomplish in our lives. For me, when I follow the five steps of the program each day, I can absolutely and instantly feel the change it makes within me. 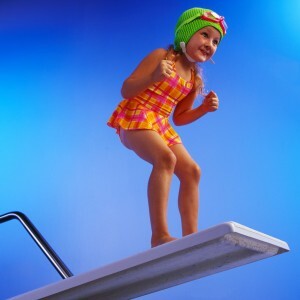 With every step, I can feel the strengthening and enlivening of my will to achieve my heartfelt goals. When I keep on tapping with EFT until I feel my thoughts and feelings shifting to a better-feeling place and I begin to feel inspired to take action, it transforms my experience of myself. Every time I do this, I am freeing myself from another layer of what has been holding me back from embracing the next step on my journey with a strong sense of purpose and will to succeed. I know from experience that the Your Inspiring Life program really works. It is a great way to develop a strong sense of will so you can live a life that inspires and fulfills you and I really encourage you to check it out and see if it feels right for you. You can sign up for my free 7-day mini eCourse version of the program in the upper right hand corner of this page. Thanks for reading. Let me know what you think by leaving a comment below. Have a wonderful day and remember to let your inner Veruca shine through a little bit more each day. What Happened to the Strong-Willed Two Year Old We Used to Be? When we were two, we knew exactly what we wanted. We felt an absolute sense of entitlement about everything as well: when we wanted something, we knew instinctively that we had the right to want it and we expected to get it. Unfortunately, as we grew older and were socialized as children and adults, we learned the opposite of this. We were taught to deny our wills for the most part and as a result we lost touch with a powerful part of ourselves and our ability to create the lives that we want. We were taught to defer to others: our parents, siblings, teachers, friends. We learned to give up on what we wanted in order to please and pacify others. In order to be loved. In order to be accepted. In order to fit in. And so, we got confused when later in life we were expected to suddenly be self-directed and know what we wanted to do with our lives and have the strength of will to achieve it. No wonder there are so many unhappy people in the world doing things that they really don’t want to. Most people have learned this lesson so well that they don’t even know what they really do want. That will muscle hasn’t had much exercise. They’ve got a good strong “please other people” muscle, but that doesn’t get you very far when you spend eight hours or more a day doing something that doesn’t fulfill or inspire you. We’ve gotten really good at jumping through other people’s hoops and then distracting ourselves from the still small voice within by watching TV or surfing the net with the time we have to ourselves. We seem to have lost the ability to create and choose and command and commit to a path and follow it until we achieve it. We don’t have many resources for being trained in developing our wills in this way and it sure isn’t common in our culture. But the strong-willed passion of our two-year-old selves is still there. It may be buried, the muscle may be weak, but it can be cultivated and encouraged to get stronger once again. In my next post, I’ll give you some ideas that will help you reconnect with that strength of will and begin to re-build you ability to know what you want and to get it. Subscribe to my blog here and get notified when I post new stuff. And feel free to leave a reply below and let me know what you think. Thanks! So What’s So Bad about Veruca Salt? But, I had a powerful insight last night. I went to bed, feeling a deep feisty determination to achieve an important goal that I have. I thought: I want it now! Universe, give it to me now! And then, I realized I sounded just like Veruca Salt. I realized that in our lives and in our culture overall, we have been taught not be like Veruca. That being like her is BAD. As a result, many of us feel like our strength of will is not as strong as we would like it to be. For myself, I am capable of getting very inspired and I am absolutely open to my heart showing me new wonderful ideas that I would like to experience and master. However, at times, I find myself losing steam, even on ideas that truly inspire me. Particularly before I learned EFT and meditation, I would let those horrible negative beliefs take over and drown out the inspiration and the will to achieve whatever my heart had been calling me to do. Which brings us back to Veruca Salt. That girl knew how to get what she wanted. Imagine having that kind of strength of will. I’m telling you, when that girl grows up, she is going to get what she wants in life. But you know what? 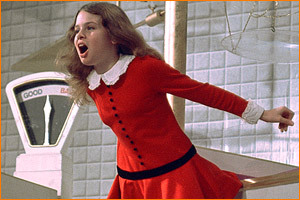 I remember that Veruca Salt really enjoyed herself in that chocolate factory. She ran through the Chocolate Room, eating and playing with the rest of them. It’s just that when she wanted something, she expected to get it. And I know that the book and movie show her wanting lots of material things, which of course we all do. That’s a whole other can of worms… our negative beliefs about whether it’s okay to want lots of “stuff.” What I say is that we are physical beings and it’s wonderful and fun to have things that are beautiful and enjoyable in our lives. I imagine that Veruca’s also got a strong sense of herself and what she wants to do with her time and her life. I doubt that she would compromise on her vision for her life and she would never take no for an answer. Imagine what she’d say to someone who told her she couldn’t do what she dreamed of with her life. And could you see Veruca Salt spending 30 years at a job that bored her when she grew up? Not likely. So, what negative beliefs come up when you think about Veruca Salt? She’s mean to the other kids because she pushes to get in first. She’s always asking for what she wants and it annoys other people. She can’t just be happy with what she has. She keeps asking her father for what she wants and she knows he will give her anything if she is persistent enough. And she usually doesn’t even have to be very persistent to get it. She is willing to do whatever it takes to get what she wants. Willy Wonka and the others don’t like her because of this. Icky. Those are some icky beliefs. If you take a step back, can you see what effect beliefs like these have on us collectively and on each of us personally? Here’s what I say: knowing what you want and being determined to do whatever it takes to get it is GOOD. 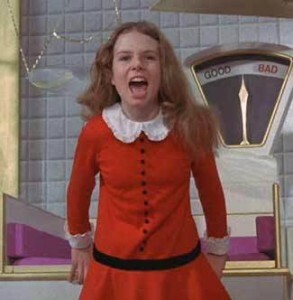 We have to be willing to be Veruca Salt! I’m serious. We have to learn to demand what we want, expect it to come to us, and not give up until we get it. If you feel a lot of resistance to that idea, it’s is time to use EFT to get rid of your limiting beliefs. If you’re not familiar with EFT, I encourage you to sign up for my free eCourse where I’ll teach you how to use EFT and the five steps to living an inspiring life. You can sign up in the upper right corner of this page. Give yourself permission to demand that the Universe give you everything you want out of life, just like Veruca does. You deserve it. In my next couple of posts, I’ll go over what happened to us and what we can do to strengthen our wills. You can also subscribe here to my blog to get notified of all my new posts and videos as they go up. Thanks for reading. And please feel free to leave a comment below and let me know what you think of Veruca Salt.